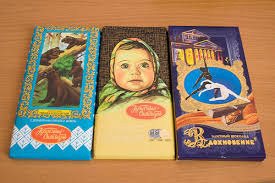 Russian chocolate has become a minor addiction for me. I eat chocolate every day, sometimes several times a day. At home in the US I avoid sweets. The reason I eat chocolate here as opposed to at home in the US has to do with packaging. 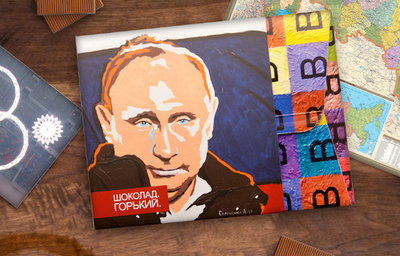 Since Soviet times, and to the present day, it is possible to go to a small kiosk, a public market, or a large supermarket and choose literally hundreds of different kinds of sweets. Each bite is packaged in beautiful wrapping. Some of the designs are artistic, some are flashy, some simply look like small versions of European or American labels. Significantly, the consumer may purchase just as much as she wants. No need to buy a box, or to have a bag of the same flavor; instead, you may purchase 100 grams of this or that, or even ask for a few pieces "to try." The sweets are addictive. The color, the mystery of so many different choices, first entranced me. Then, to my surprise and delight, the rich, wondrous tastes of these packaged bonbons, all have served to further fuel my desire to eat Russian chocolates. Yesterday I tried something that translates as "kiss-kiss"- a caramel. But as I sucked and chewed out popped my lower crown. Luckily I didn't swallow the cap. I put it in an envelope and then went off, after brushing my teeth, in search of a dentist. In Russia, dentistry is called Stomachtology, from the Greek word (stoma) for mouth. After the fall of the USSR, Russian medical services changed. Anyone may now choose private clinics. Some clinics operate 24 hours a day, and their equipment rivals that of the USA. Unfortunately, so do prices. American dentists have always charged me much money, so I worried about paying a dentist, even in Russia, as well as getting my crown glued back into my mouth. After calling a colleague I decided to go to the 24/7 clinic in the centre of town, and stolidly prepared myself to pay whatever they asked. In Russia many things can surprise foreigners. For example, having a central location may not mean the highest prices. Additionally, having a procedure, medical or dental, is priced according to the whim and economic needs of the medical doctors/dentists and their staff. And finally, these medical operations have to pay off the government in the forms of taxes and all sorts of 'supplementary dues' - so entering a medical expert is often a game of financial Russian roulette: you never know exactly what you will be charged, because it depends upon when and how much taxes and 'extra' taxes that the doctor has had to pay to survive. I took a hundred dollars with me. Entering this large clinic I saw it was cheerful, brightly lighted, and filled, no, overfilled, with trim middle aged nurses in uniform. There were no clients. Worried, I explained my problem and then bleated out: "So, how much will this cost?" "Sit down and be quiet," commanded a red headed nurse. "I will see if a doctor is available." I sat, gulping; the interior now looked very expensive, even chic. Six nurses, all with nothing to do. Three of them stopped filing their nails and surreptitiously looked me over. Me - in old tennis shoes, my European jeans, and a blue windbreaker. But no jewelry, no manicured nails or signs of being bourgeois. After several minutes the redhead returned and led me down the hall. "Sit here," she commanded. "But nurse," I said plaintively, "How much is this going to cost me?" "No idea," she replied primly. "Ask the doctor yourself." I sat, and just gave up. It couldn't be more than 100 bucks. I closed my eyes. "Hello," said a thirty something bald man in spotless white medical jumpsuit. "Come in. You understand my Russian?" I nodded, and followed him, meekly. He pointed to the dentist chair and I crawled on it. Then, quietly and efficiently, he and his younger male assistant mixed some glue, and glued my crown back on the remainder of my tooth. The procedure took about five minutes. The two men worked deftly, with no small talk. "Ok, how do you feel?" asked the dentist. "For you, nothing," he replied, looking at me in the eye. "But it is real work," I replied, "I must pay." "No. Just tell the other Americans that not all Russians are bad people." He winked and opened the door, and wished me good day.